1. Which device is used to create or divide broadcast domains? 2. Which option identifies the primary interface which would be used for initial configuration of a Cisco router? 5. What does the term "attenuation" mean in data communication? 6. How many host addresses may be assigned on each subnetwork when using the 130.68.0.0 network address with a subnet mask of 255.255.248.0? 7. Which subnet mask would be assigned to the network address of 192.168.32.0 to provide 254 useable host addresses per subnetwork? 8. A company is planning to subnet its network for a maximum of 27 hosts. Which subnet mask would provide the needed hosts and leave the fewest unused addresses in each subnet? 9. What type of network cable is used between a terminal and a console port? Refer to the exhibit. What destination IP address will PC1 place in the header for a packet destined for PC2? Refer to the exhibit. 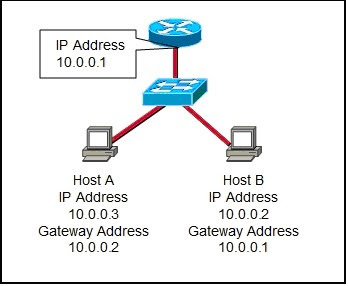 Based on the IP configuration shown, what would be the result of Host A and Host B attempting to communicate outside the network segment? Refer to the exhibit. How many subnets are required to support the network that is shown? Refer to the exhibit. A student is setting up a home network primarily used for extensive file transfers, streaming video, and gaming. 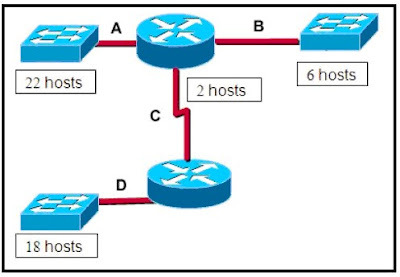 Which network device is best suited to these types of activities in the topology shown? Refer to the exhibit. A network administrator has decided to use packet capture software to evaluate all traffic from the student subnet on the way to the Internet. To ensure that all packets are captured, what network device should be used to connect the monitoring station to the network between R1 and R2? Refer to the exhibit. Assume that all devices are using default settings. How many subnets are required to address the topology that is shown? 21. 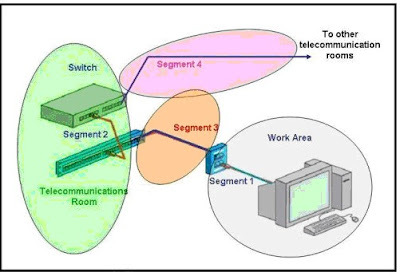 To establish a console connection from a computer to a Cisco router, which cable wiring option would be used? Refer to the exhibit. A network technician has been allocated the 192.168.1.0/24 private IP address range for use in the network that shown in the exhibit. Which subnet mask would be used to meet the host requirements for segment A of this internetwork?